Tyrone GAA chiefs has concerns over new All-Ireland structure. 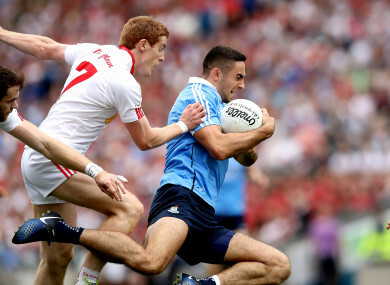 Tyrone faced Dublin in this year's All-Ireland semi-final. FEARS HAVE BEEN expressed that the new ‘Super 8′ structure in the All-Ireland football championship could lead to teams playing to lose in order to get a preferred semi-final fixture. Tyrone GAA chief Dominic McCaughey has speculated about the potential problem arising in his annual report and has also called for the introduction of a two-tiered senior football championship to ensure that counties meet teams of similar standards. “Clubs and counties will face major changes in their football fixtures’ programmes following the changes introduced at recent Congresses,” writes the Tyrone secretary. “We have warmly welcomed the notion that the inter-county fixtures should be completed within a shorter time frame thereby making available more time for clubs’ fixtures’ programmes. use of extra-time in a wide range of games. “However, the introduction of a ‘group stage’ for the All-Ireland quarter-final – where the eight teams play off in two groups of four – is contrary to the objective of shortening the inter-county season. “Part of the reasoning for this so-called ‘super-eight’ stage is to ensure that more high-quality games of football at the height of the season will take place. “Unfortunately this cannot be ensured – there may be some high-quality games, but there is a greater chance that there will be nothing at stake in the final games within each group, and there is a possibility that some teams may decide to play for a desired outcome, which would potentially lead to a preferred semi-final fixture. McCaughey has pointed out how grading works successfully at club level and in inter-county senior hurling. “The only way in which there can be an increase in the number of high-quality inter-county football championship games is by introducing grading, as is done for clubs in every county, and as is done in inter-county adult hurling. “The association should introduce at least two grades of football championship in which county teams would be competing against those of similar standards. “This system works perfectly in the four divisions of the national leagues where well-matched teams achieve appropriate results. “In the hurling championship each county is accommodated at a level where it can aspire to success, whether it be attempting to win the Lory Meagher Cup or the Liam MacCarthy Cup. Email “Fears that teams may play for 'desired outcome' in Super 8 and calls for a two-tier championship”. Feedback on “Fears that teams may play for 'desired outcome' in Super 8 and calls for a two-tier championship”.